Homeopathy is a safe, gentle and scientific system of healing which releases the body’s own natural abilities to heal. Homeopathy does not superficially suppress symptoms, but rather heals from within. It is non-toxic, non-addictive, effective and long lasting. This form of holistic medicine is used to treat the person’s whole “state”. Homeopathy is recognized by the World Health Organization as the second largest therapeutic system in use in the world. Homeopathy works for children and adults of all ages, as well as for animals. People choose homeopathy for many reasons. Some use it for help with a specific condition. Others in good health use it to stay that way. Homeopathy is an alternative treatment that can help you regain your vitality and feel like the person you used to be. 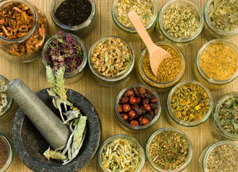 Homeopathic remedies are unique, extremely diluted medicines made from thousands of different substances drawn from the mineral, plant and animal kingdoms. Common remedies include red onion, arnica (mountain herb), and stinging nettle plant. Treatments are individualized and tailored to each person—it is not uncommon for different people with the same condition to receive different treatments. For more information on homeopathy, please contact us or make an appointment.